Christine DeVito - Call on Dolly! 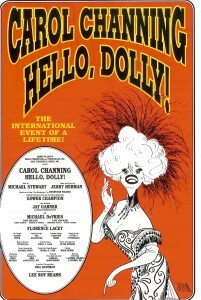 As it is with many of the generation of the end of the sixties/early seventies, Christine DeVito’s earliest memories of Hello, Dolly are of the movie starring Barbra Streisand. She was not aware of any live production of Dolly prior to that. She doesn’t remember how old she was at the time but she does recall being attracted to the dancing and the big production numbers. Christine was three when the film first came out so she is assuming that she was probably in middle or high school by the first time she saw it on television. 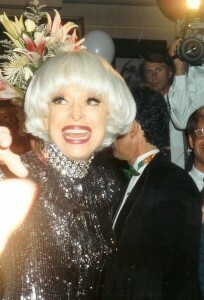 Years later, Christine would go on to appear as Ermengarde on stage in the thirtieth anniversary tour and Broadway revival starring Carol Channing in 1994 and 1995. Christine went to the Boston Conservatory of Music. She performed in her high school and through summer productions building up her resume. Her first big break was with Jerome Robbins’ Broadway. She was a replacement in the Broadway Company and did the last three months of the Broadway run. They were going to take the original company on the road so she wasn’t originally asked. Fate intervened, someone dropped out, and she did the tour with Karen Mason. She was told she had two weeks to get ready. Jerome Robbins was coming in to work with the company. She didn’t get recast to do what she was doing on Broadway. This time, she would be doing a different track. She also had to cover. She did the entire national tour of that production which was a fabulous experience. It was also stressful whenever Jerome Robbins showed up wondering how he was going to be when he arrived. Will Mead who worked closely with Gower Champion AND Jerome Robbins said that when Gower arrived at the theater, everyone upped their ante because they genuinely desired to please him. When Jerome Robbins arrived at the theater, everyone upped their ante because they were afraid they were going to be fired! Christine never worked with Gower but she agrees with that assessment of Robbins. Christine relationship with “Mr. Robbins” was that she was the short girl who was brought in to replace someone. She proved herself. If you weren’t fired, you were approved. It was a REAL National tour, not like the ones of today’s world. She was in LA for six months; they went to Japan for three months. They traveled all over and were treated very well. It was a big tour and, once again, a great experience. There was a lot of pressure to live up to the quality of what was expected on stage. She was thrilled to get to do that. When that ended, she came home for a short while before departing again for a European tour of West Side Story. That was where she met her husband and that was great because of all of the traveling they were doing together all over Europe and getting paid to do so! Although it was a European tour, they traveled with an American orchestra, Wolfgang Bach. They did a lot of West Side Story tours. This tour had already been up and running when Christine joined the company in Paris for about six months. She has such love for Jerome Robbins’ choreography so it was great to continue with that. When that tour ended, she came back home and auditioned again for Cats as she had done many times previously. This time was a charm. She got cast! 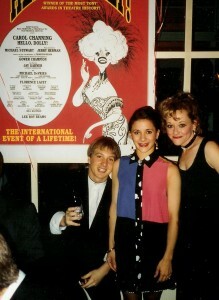 She was with the Broadway Company of Cats a little over a year. THEN, Hello, Dolly came up. Christine went to an EPA (Equity Principal Audition). She auditioned for the late Mark Reiner, who was the casting director. She went in, sang her song, and he asked her to cry. She did her “Wah wah wah” and she got a couple of call backs. She had auditioned for the Paris company of Dolly that Lee Roy Reams directed which starred Nicole Croisille. Several of the people who ended up in the Channing Company were a part of this company. Christine originally auditioned for Lee Roy. She auditioned and wasn’t right for it but Lee Roy saw her dance at that audition. When she had her call back for the Channing company, he remembered her. When she got cast, he often commented that it was a shame that Ermengarde didn’t really get to dance that much because he appreciated her technical skills as a dancer. The fact that she had auditioned for the Parisian company was probably helpful in terms of her auditioning once again for Lee Roy. She sang her song for Lee Roy, read, and met Carol. She still remembers the way Carol pronounced her name, “Christine DeeVVViiiitttttooooo…” Christine shook her hand and then a group of them were taken into another room with different gentlemen who were being considered for Ambrose. There was a lot of mixing and matching with the different Ambrose’s and Ermengardes. Christine was not the first choice. 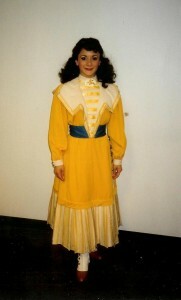 Susan Bernstein who played Minnie Fay in the Paris production was first offered Ermengarde. They were offering Minnie Fay to someone else so Susan declined declined. Christine is not sure whether or not anyone else was offered the part but she was thrilled. Christine was somewhat torn because her vocal coach asked her why she was leaving a Broadway show to go on the road. 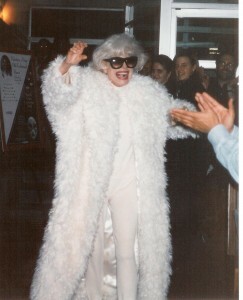 Christine’s response was its Carol Channing. It’s Hello, Dolly! It was a big “international” tour. The plan also was that the show was going to Broadway. Christine's Leg Warmers are actually Monica Wemitt's gloves! Christine had auditioned so many years to get into Catsand head only been in the show a year. She could have stayed in that show for a decade and danced all that time. Her partner, Roger Kachel, who has since passed on, had finally gotten adjusted to her and vice versa and she had settled into the show. According to Dance Magazine, Mr. Kachel learned every male role in Cats over the course of 11 years, having performed in four different “Cats” companies as a swing member. On the other hand, Cats was a very grueling show physically. That aspect also entered into Christine’s decision. Christine knew that this was an amazing opportunity AND it was a white contract, a Principal contract. As a chorus dancer, you never know how many of those will come your way, even thought it was a small role. 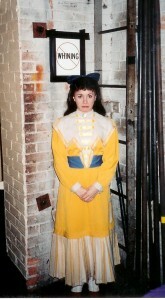 She also got to understudy Minnie Fay. She did get to go on a couple of times. There was one memorable time that she did go on which we will come back to. She made the decision to leave Cats and she never regretted that decision. She is so happy about what transpired. She was still performing Cats at night when she was in rehearsal for Dolly. She overlapped the two as much as she physically could. They rehearsed in New York with their first scheduled stop being Denver. This was all leading up to Broadway with a last stop at The Kennedy Center before Broadway. Going into this show with a star of Carol Channing’s magnitude, Christine did not know what to expect. Would she speak to the cast? Would she speak to them? Would they interact? As has been reported with previous companies, Christine does not recall being given instructions on how to interact with Carol. Everybody just wanted to take her in. She had a little tent set up in the rehearsal studios for her changes. She would go in to have a snack or change her clothes or whatever. She changed her skirt a lot to get the feel of different costumes. Christine just threw herself into the proceedings. The thing that was different for her was, although her part was small, in the beginning of the show, she had a lot of physical contact with Carol. She was a stranger obviously at first. They didn’t know each other. togetherness…in the timing of the music and the timing of where they were coming and going in the scene. Certainly in the first couple of months in the tour, there was a definite feeling of pressure to really being there for her. There had already been so many companies and so many people who had played these roles. Were they living up to the expectations of what she desired when she looked at you? Christine felt like it was left up to her to do what she wanted with Ermengarde. She was never told what she must or must not do. She played around with and tried different things with her voice and mannerisms. She felt that if the stage manager didn’t like something she was doing, they would tell her. There was definitely a sense of “I hope I’m doing a good job. I hope this is what she is expecting.” No one ever talked about it. Christine also felt like if she was not “doing it wrong”, she was OK. There were staging issues early on in the rehearsal process but never characterization issues, making sure she was ‘here’ instead of ‘there’ which caused traffic issues that they had to get past. It never came down to the way Christine was handling a line or a scene or anything along those concerns. When they opened, that sense of another opening night was intensified by the fact that they were opening with this iconic person. It was definitely a tingly feeling. Everyone knew that they were in a special production. This was someone recreating THEIR role. This was THE Dolly. Everyone wanted to make sure that they rose up to the occasion…that the laughs and timing should hit exactly where they should be. The reviews were great in every city. Once that “whew” feeling passes, you get on a roll. You begin to relax more and more. That took a couple of months to take over. It takes time for everyone to get to know each other. Because they did such a long tour before they got to Broadway, it was also very difficult to keep that energy, that freshness for that length of time. Having Broadway on the horizon, that wonderful thing that everyone was working towards. 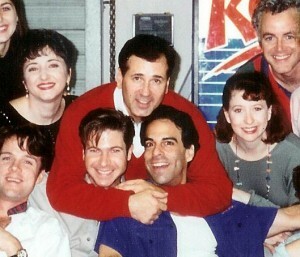 So many people were making their Broadway debut with this show. They all knew they were going to be together as a unit; working up to that goal…but it was still a long time away. For Christine, when you talk about Denver and all the other exciting cities they played, nothing compares to that Broadway opening. Sitting there on the settee with Carol, she would say one thing or move her eyes one way and that New York audience would go insane. They sat there for what seemed like minutes for the audience to stop laughing and/or applauding so they could go on. Also, for Christine it was a REAL opening night. There were also issues prior to the opening that I hope to address in another chapter. On tour the conductor was Tim Stella, who was also Florence Lacy’s husband. Lee Roy Reams and others in the company have already expressed how wonderful he was. Christine, as well, felt that he did an amazing job. Several reviews, on more than one occasion, even cited how amazing this ensemble sounded. For whatever reason, however, Carol was unhappy with him. She had him replaced with Jack Everly. Jack Everly is an American conductor and music arranger who serves, as of this writing, as Principal Pops Conductor with the Baltimore Symphony Orchestra, Indianapolis Symphony Orchestra, Naples Philharmonic Orchestra and National Arts Centre Orchestra (Ottawa, Canada) as well as Music Director for the Symphonic Pops Consortium. For the cast, it was a difficult transition. It was a bit traumatic. There was a feeling on Carol’s part that tempos weren’t what she desired. The rest of the cast, it must be stated, did not feel that. It was something in Carol’s head that she needed to do something about. It was not the feeling of anyone else in the company. It was doubly difficult because Florence Lacy was married to the conductor that was being replaced. Florence was a major player in the company and this was very personal for her. Manny says there were other commitments with the theater. Christine remembers auditioning for casting director Jay Binder around this time and him asking her, “What are you doing here? You’re going to run forever.” They ran three months and were back out on the road. It was so sad, especially for those who just made their Broadway debuts. They just got there and they had to go. That was really hard. That was hard for Carol, too. It would continue on for a few more months after the Broadway run. Unfortunately, Charles Lowe was in failing health. Christine continued on for the extended tour but, very sadly, had to leave the company ten days before the tour ended. That was heart breaking for her. Many of the original company did not continue with the extended tour. There was also an influx of new players which Carol had to adjust to, as well. It was also a bus and truck when they went back out. They were doing shorter stays which was more taxing on Carol and everybody. When Charles started to be in not such good health, Carol wanted to be with the cast on the bus. Instead of being in her private car, she was right there with the cast on the bus. The cast was concerned about Charles. To see someone who had been at every single show However, it was something very special for those who had shared in this journey from the very beginning. They had been a solid production for over a year with practically no changes in the company. The plan from the very beginning was that this was going to be an international tour. (See Carol’s curtain speech in my chapter on Matthew Sipress). Everyone thought they were signing on for that. 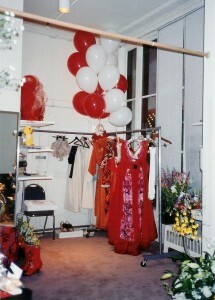 From time to time, various “investors” from around the world would show up to see the show and the cast were made aware when they showed up. For certain people, it was a disappointment that THAT would not be happening. Christine had already traveled to Europe and Japan in previous tours so she wasn’t heartbroken about that not happening. Being on an international tour means you are farther away from family and friends. Looking back on this entire experience, Christine feels that she probably took everything way too seriously at that time. She practiced her “whaas” all the time in her dressing room! She was asked on more than one occasion to shut up. 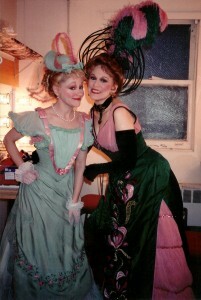 She shared a dressing room with Monica Wemitt. Monica never told her to shut up. They not only always shared a dressing room throughout the tour, they also shared hotel rooms. They shared a lot and still maintain a long distance love this many years later. They haven’t seen each other in a while as of this writing. Monica was Carol’s standby and actually went on for her one night. That was a tough day! She was told from the beginning that she would never go on. It was a frightening day when she found out that she would, indeed, be going on THAT AFTERNOON! They didn’t really have costumes that fit her which was a sham and a shame. They were piecemealing everything together for her. No matter how Carol felt, she was a trouper and went on. In this instance, however, Carol got a stomach bug and it was virtually impossible for her to perform that night. She had to stay in the hospital because of dehydration. She was FORCED to stay in the hospital for twenty-four hours. Christine remembers scrambleness, nervousness, shock, and a lot of nerves. Costumes were not ready. Monica was not ready. Everybody was there for her. Everybody knew she could do it. She is a fabulous actress, comedienne, and singer. Christine ran lines with her and told her not to worry about the lines but to just get the gist of the scenes. Everybody was there for her. Just keep moving forward. Unfortunately, it could not be something for Monica to enjoy. The feeling was “Oh my God! I have to do this.” Obviously, the audience was disappointed that they were not going to see Carol Channing but Monica Wemitt rose to the occasion and the production values were very strong. When you go on as an understudy, and Christine has had previous experience as an understudy, the goal is to try and not disrupt the other players show. She never got to go on many times in a row; she only got to go on here and there. You know that as meticulous as you can be, you’re never the same person you are filling in for. The way you hold someone’s hand, the way you look at them is going to be a little different. Being a perfectionist personality that she is, when Christine covered for someone, her goal was not to disrupt someone’s show. 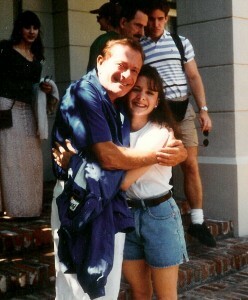 She loved when she went on for Minnie Fay and had fun with it. During the first part of the tour, she went on as “an ugly blonde”. When they were on Broadway, Tommy Tune was supposed to be in the audience one night. For Christine, this was a big deal. Lori Ann Mahl, Minnie Fay, of course did not desire to be out that night. Lori Ann, unfortunately was not feeling well but wanted to go on. Christine was told she probably would not find out till half hour. It had been six months since Christine last went on in the role. Her parent’s also happened to be in the Bronx visiting her grandma. Christine called her parents and told them not to leave the Bronx that she might be going on for Minnie Fay that night and that better get their butts to the theater, that this might be her only chance to play this part on Broadway. She got the call that she was going to go on. It went very well. She read one of the “Cherries and Feathers” lines and heard Tommy Tune laugh out loud in the audience and she was thrilled. Her parents got to see it. 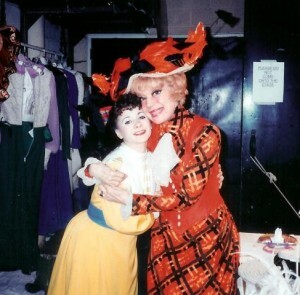 It was her only time on Broadway as Minnie Fay and it was memorable. It was meant to be. 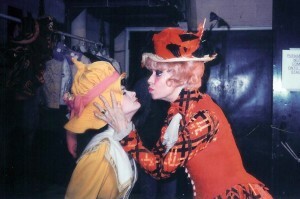 Being with Carol Channing was a two and a half year experience. Her relationship with Carol definitely evolved. With all of the comedic women in the show, the beginning with her was a little tense. She tested them a little bit on how they were going to fit with her in the show. 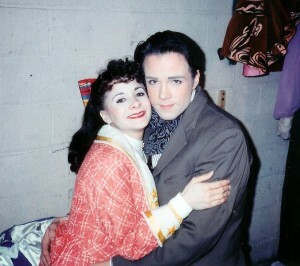 Christine’s wildest moment on stage with Carol took place one night on Broadway on the Settee. Christine had to help her out with a line. One thing that everyone realized that was helpful to Carol was not to paraphrase and not to improvise within the scene. To help her, the best way was to give her the line as if your character was saying it. She would hear the actual line and know exactly where they were. Christine was able to do that. It worked out very very well. Christine knew they were in trouble and thank God the right words came out of her mouth at the right time and the right way. Carol very much appreciated it. All of their relationships with Carol evolved, as she realized that everyone was there for her. They were not there to compete with her. They were ALL there to make sure that she could have the best show in any way. Once that happened, she was able to relax and she loved everyone. Some of the funniest moments that Christine shared with Carol usually took place on the cart leading into the middle part of Sunday Clothes. James Darrah was always at the front of the cart getting ready to push them out. Carol and James always had wonderful conversations during those moments. They got along great. Christine always felt that she had nothing to contribute and would just sit there with a grin on her face. She had her little Ermengarde hankie. When it was about ready, she would start beating out the time as they were heading out on stage: One, two, three, four, five, six, seven eight, “Ermengarde, stop sniveling. Don’t cry on those valises…” Christine would do this so that Carol and James would get a sense that they were all going out. They were embroiled in these great discussions JUST before going out. Carol realized what Christine was doing and just before saying her lines, she would always say something funny to Christine, things like, “I just ate a raw onion”, OR “I know what you should be. You should be a jockey. You would do it so much better than anybody else.” She knew Christine’s huband was a musician. One time she said, “What does he play again?” Christine said, “He plays the oboe.” Carol said, “Everybody knows the oboe makes you go insane.” She would say these crazy things to Christine seconds before going on stage! Christine never knew what was going to happen on that cart. She and James would be conversing, she would say something quirky to Christine, and off they would go. Christine brought a person who was always there ONE HUNDRED PERCENT to the production. She was constantly working on her character. She doesn’t know if that was necessary, but for Christine, it made her feel like it wasn’t just a slapstick moment and that she the character came from somewhere more meaningful. 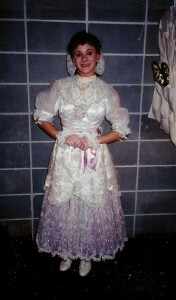 The Harmonia Gardens costume that Jonathan Bixby designed for Christine for the Harmonia Gardens scene in Act Two was a work of art. It was very heavy. Both of her costumes including the crazy Ermengarde hat at the top of Act One were not exactly like the original Freddy Wittop designs. They initially put her in a synthetic wig. Being a tiny person, Christine remembers saying to the costume department that she needed to be in a human hair wig. The wigs were designed by Paul Huntley. Eventually, Christine was able to have her wig switched to a human hair wig that looked more natural on her. She had a big bow in her hair and she purchased little hankies to go with her dresses and the costume department was cool with that. That was a bit that Christine brought to her character. She always felt that Ermengarde should always have a hankie because of her emotional state. Again, she was being very method about Ermengarde. Some of the wonderful things about Carol, this wonderful star, affected Christine very deeply. She has tried to carry on and treat others in a similar way. She did wonderful things for the cast. As has been reported previously, she bought out movie theaters for the cast. She rented gondolas in San Antonio, Texas and took the entire company out on gondolas rides. She met with cast member’s families on stage when she was tired and her feet hurt. She would meet with someone’s grandpa and say something nice about YOU, not about her. She didn’t play the star. She talked about YOU. She did these wonderful gracious things. Yes, there were times when she was tired and not feeling well, but she was there. That’s the type of entertainer Christine aspires to be. Christine was not one for joking around backstage and she is sure sometimes she was labeled as a “stick in the mud” with that. Christine would look at someone like Carol and think, “Wow! This is someone who steps out on stage and gives one hundred and ten percent for this production and to please the audience.” That’s what keeps entertainers fresh and the show fresh. It is not about the star, it is about the new audience every time. The show succeeded in every city they played. That can be attributed to the themes of the musical that the Dolly Levi character brings up. It is a joyous show about love. It is about relationships. It’s fun. It makes people laugh. There is Dolly’s relationship to her late husband. She has experienced this loss but still communicates with him. He is always with her. These are all profound elements, themes, and images throughout the musical that are still light and fun and slapstick that resonate with audiences. It is more than just that because of those themes. The worst thing about being on a tour of this length is being separated from family. It was mentioned earlier that Christine left the show ten days prior to the last performance. The reason for that was that her grandfather was dying. It was so hard to go to Charles and Carol and say that she had to leave. They totally understood. Christine wanted to finish the show but did not regret her decision. She got two visits with her grandfather prior to his passing. If she had stayed, she probably would have seen him for a minute. It was the right thing to do. All of the touring Christine did was before 9-11. It was a different time to tour. 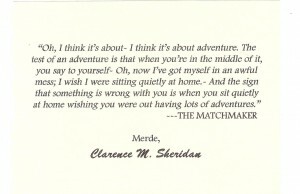 She is so glad she had that experience because she traveled and saw the world. She saw many of the different states in the United States and different countries. It just broadened her horizons to see different cultures. 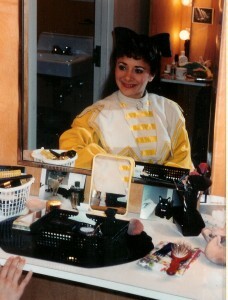 The last tour Christine did was Disney’s Beauty and the Beast in 2000. She also did that tour with Monica Wemitt, once again being roommates! Christine had left the company prior to 9-11. The company was in Boston on that date. Christine recalls calling the company and thinking that she could have been there with all of them. They used to travel with cutlery and coffee makers and irons and other sundry items that you can no longer travel with. That is a thing of the past and security and the hassles are now part of the experience. Unfortunately, because Actor’s’ Equity is trying so hard to hold on to jobs for its Union members, the sizes of the companies AND the size of salaries have also been cut down. In the twenty years since Christine first got involved, actors are making less money! 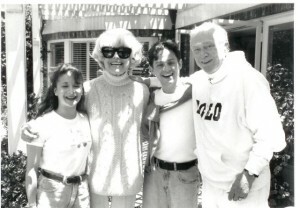 Just as she was embarking to begin the Hello, Dolly tour, her then boyfriend and her were doing a very grown up thing, they were buying a house. He is now her husband (seventeen years as of this writing). When they were in rehearsals, castmates were commenting on her very grown-up conversations over the phone. She was trying to close a mortgage. The night before she left for Denver at the beginning of the tour, he asked her to marry him. She was planning her wedding the entire tour. Girls that were in the show with her helped her pick out her wedding dress. Carol gave her an entire set of champagne glasses for her china set. All of that was part of her Dolly year leading up to her wedding. That made all of that tour even more special for her. 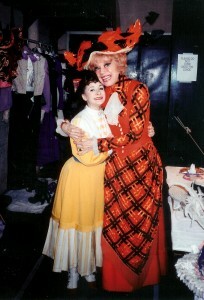 Hello, Dolly was definitely the most special show she did. It had a lot to do with that “family unit” being together for a year, having a company being together all the way through a tour and Broadway opening, having that goal in common, supporting such an iconic star. There are so many different elements. As mentioned earlier, add planning a wedding to that. Once again, when they went back out on that bus and truck, it wasn’t quite the same. However, they had the wonderful Lee Roy Reams playing Cornelius Hackl! Christine, Lee Roy, and a few others became antiquing buddies and that added to that part of the experience. That bus and truck had its own special relationships as well. From start to finish, Christine definitely had a sense of being part of something special. That was a really nice feeling. In the past, as stated before, she had always been a replacement. She had a very strong sense of this truly being one of those SPECIAL MOMENTS. Hello, Dolly is an iconic show and one of the best musicals ever written and although she would like on some level for their production to be the last production of Dolly on Broadway, it should definitely come back. Christine’s dream Dolly would be Bette Midler. She is a petite actress but other petite actresses have also played the part. As of this writing, The Signature Theater in Washington DC is joining forces with The Ford’s Theater for a production that will be the first production of Dolly to be presented in Washington for the first time since Carol Channing’s production in 1995. This production will star Nancy Opal. Rumor has it that they are removing iconic images such as the stairs at The Harmonia Gardens AND Dolly’s famed red gown. Christine’s immediate thought is WHY!?!?! She guesses that as far as the dress is concerned, one could make it their own if they desired to change it somewhat. 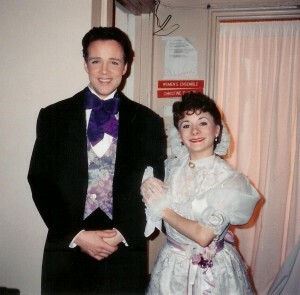 After leaving the Beauty and the Beast tour in 2000, Christine began building a teaching career. It was a very difficult decision for her to leave the performing aspect of her career. As a younger person, she was meant to entertain. That was her gift. She is an all or nothing gal. IF she was going to be a teacher, she was going to commit to that one hundred and twenty five percent to her students. She did not like the uneasiness of not knowing what she was going to be doing. An entertainer lives decades of asking the universe to just let them do what they were meant to do. Being a tiny person, she was well aware that many jobs were not going to be available to her. She had to be a relentless auditioner. 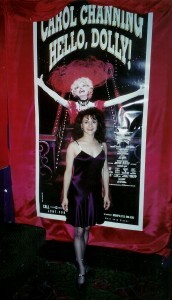 Her dream was to appear on Broadway and she accomplished that. Would she have liked to do it more? Sure. But for her, she is satisfied. When she first started teaching, she did everything, musical theatre, acting, musical theater performance, ballet, tap, jazz. That morphed itself into the dance studio that she taught at for fourteen years really needing her to be the main ballet teacher. She is now Miss Christine. For the past eight years, she also works at an ice skating rink that houses four rinks for completive figure skating for aspiring Olympians. She is there as a ballet teacher, stretching, a coach; she teaches Pilates there. She helps them with their programs if they need to be more graceful. She works on their arms, their presentation, and performance skills. She really enjoys that, because along with dance, she is very interested in physical fitness. Over the years, she has a vast knowledge of Pilates in her studies. It has helped her as a dancer not to have too many aches and pains. Being married to a musician, her husband still plays on many Broadway shows. She gets to go to those wonderful parties and still be part of the scene. It is still so important for ALL of us to still support the arts and funding for the arts. Everything is being slashed, dance companies, Broadway companies, cutting down the sizes of orchestras. It is all really unfortunate. Ticket holders are spending still so much money on their tickets and there are now fewer jobs for actors. There are fewer jobs for musicians. When they get the jobs, there is less pay, especially on the road. When she was on the road, a producer once asked her if she wanted to be the road or at home. She was always pulled towards “I want to go home.” That also led towards her being a teacher and leaving the business. She didn’t want to go to Florida to play a part. Christine once had a great teacher in Connecticut named Arlene Begelman. She headed a school of the performing arts for many years. One thing that she did that Christine hopes to do for her students is to be extremely honest with them. This is a tough business. It is a really competitive tough environment. You have to know where you fit in. You have to be very prepared in your skills. Most kids going into the profession nowadays have an idealized version because of shows like American Idol. Unfortunately, so many kids today just feel they want to be stars. They want to be famous and make money. Christine just wanted to dance when she started out. IF she got paid, that was great. She did dinner theaters all over where she made one hundred dollars a week before she got into the union. They fed you, you were put in a house, and you were thrilled. With computers and the internet, there is a sense of immediacy that young people have now. They may be talented, but they don’t realize that there are thousands of kids with the same skill level and how difficult it all is. Christine has many kids who, at the very least, desire to go on and be a dance major or a minor. Christine feels that most don’t even realize how tough that is let alone professionally to a career in dance or music. She tries to be honest with them and share her experiences. She tells them how things have changed since her days on Broadway and touring with less jobs and less pay nowadays. That is not the way it goes in most professions. 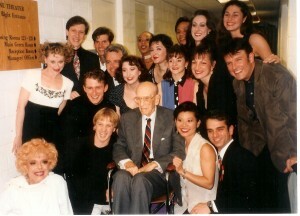 We may have seen the height in the nineties of Broadway or touring companies, for sure. Touring companies have changed so much. We no longer see touring companies settling into cities anymore for six months and paying Broadway pay. That last night when Christine went in to say goodbye to Carol and Charles to let them know that she had to leave the show because of her ailing grandfather, and the cast creating a circle around her that last night after the show, she stood there and just bawled. No words could come out. Life was now imitating art. She WAS Ermengarde. She was overwhelmed that she even felt that way after such a long run with this show. She remembers looking over at Jimmy Darrah and how painful this was for her. The entire company was sharing in this grief. She also knew that she was releasing her participation in this production and that her understudy would finish what she began. Michelle Tibbets took over. Of course, you desire them to succeed but there is a tinge of ownership. She doesn’t remember the city but she remembers how tough it was AND she did get to say goodbye to her grandfather. Her parents always supported her ambitions. They knew nothing about it but they were behind her. They knew that she kept getting shows! They thought it was working out OK. Her grandfather always asked if she loved what she did. Her grandfather was an Italian welder. When he saw her Broadway paycheck, he had respect for what she was doing. That last time she saw her grandfather, he told her it was time for her to stay home for a while. Home started out on Valentine Avenue in the Bronx but her family moved to Connecticut when she was five. St. Philip Neri was their family church. 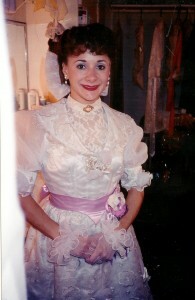 Being involved in this production of Hello, Dolly gave Christine DeVito a true sense of feeling a family in the theater. Not to be corny, Christine felt this like she never did before or sense with a Company. They WERE working together FOR Carol Channing. It was such a special thing. Over the years, people in this profession loses touch with one another. This company has remained in touch with one another. She feels like she can pick up the phone and call anyone from this company and it will be like old times. There was also drama between company members. There always is. But THIS was a unit!